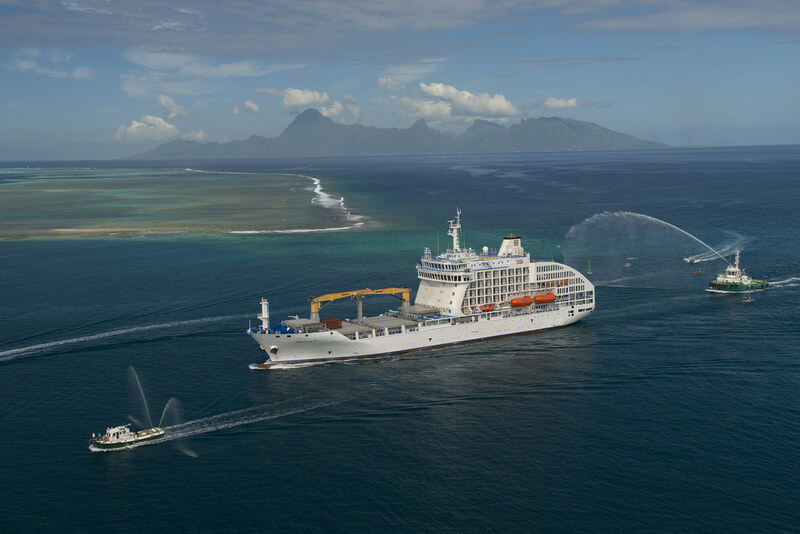 Aranui Cruises’ new ship Aranui 5 has arrived in its new home - Tahiti. With the dramatic peaks of Moorea in the distance, the 126-metre long freighter cruised into Papeete for the first time yesterday to a traditional water jet welcome from local tug boats. Aranui 5 will now spend a month in port making final preparations for its maiden voyage on December 12. The inaugural cruise coincides with the Marquesas Art Festival - held in the far-flung archipelago once every four years - providing guests with a rare double thrill of local ceremonies at each maiden port as well as a spectacular celebration of Polynesian culture and tradition during the ship’s call to Hiva Oa. Aranui’s Regional Representative Australia New Zealand Laurent Wong said he was thrilled Aranui 5 had arrived in time for the arts festival. “Guests travelling on our maiden voyage will truly have the trip of a lifetime as the first to enjoy the luxurious comfort of our new freighter as well as experiencing the Marquesas during a time of brilliant colour and activity,” Mr Wong said. The custom-built dual-purpose vessel replaces Aranui 3 and will continue to dispense cargo to ports across the Marquesas, Tuamotu and Society Islands while passengers disembark and explore the islands. With capacity for 254 passengers, Aranui 5 offers a range of accommodation options, from the operator’s first single staterooms to new premium and deluxe categories, styled in a natural colour palette, with Polynesian flourishes including Marquesan-inspired décor and Paul Gauguin prints. To cater to the demand for balcony cabins, more than half of the ship’s rooms (60) feature a private balcony - five times more than offered on Aranui 3. The new cruise freighter also offers suites with king beds, airconditioned public spaces including a restaurant, two conference rooms, lounges, a library, a computer room, a boutique, a swimming pool with a whirlpool, a fitness room, a spa and four bars, including the popular Sky bar. Aranui’s 14-day roundtrip cruises from Papeete visit Nuku Hiva, Ua Pou, Tahuata, Fatu Hiva, Hiva Oa, Ua Huka in the Marquesas, Takapoto and Rangiroa in the Tuamotus and the famed Society Island of Bora Bora. The freighter line dispenses a lifeline of food, fuel and other staples to remote island ports while passengers disembark and explore a range of complimentary excursions including hikes, 4WD tours, a visit to the Paul Gauguin museum and a picnic on a secluded beach in Bora Bora. Packages for Aranui 5’s April 30, 2016, departure start from $6363* including all meals, excursions and wine with lunch and dinner onboard. n.b Aranui 5 replaces Aranui 3 as the number 4 is considered bad luck by the third generation Tahitian-Chinese family who own the cruise company. For more information or to book visit www.aranuicruises.com.au or call 03 9449 3778.